A Nashville based electrical contractor needed to locate conduits in a metal pan deck slab at Centennial Medical Center. Prior to core drilling, they needed a safe and effective way to locate conduits and eliminate the threat of hitting a conduit and knocking out power to the active operating room below. They called Ground Penetrating Radar Systems to scan the area using GPR and Radio Detection. GPRS was able to identify conduits and provide them with areas they could safely drill. Other services we offer are: Underground Storage Tank Locating, Utility Locating, Rebar Locating, Void Location, and more. 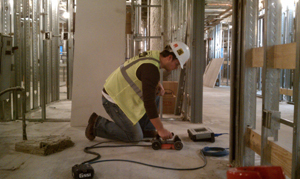 If GPR services are needed in Tennessee, call Dave Schaff at (615) 418-4023 or email at dave.schaff@gprsinc.com.